Large screen printer for curve surface (Auto registration)(WE-1200C-M) - Guger Industries Co., Ltd.
Power: 220V 50Hz single phase. A durable and trouble free Germany made "FESTO" or Japan "SMC" pneumatic components have been used on the machine gives the most superior performance in process of printing. 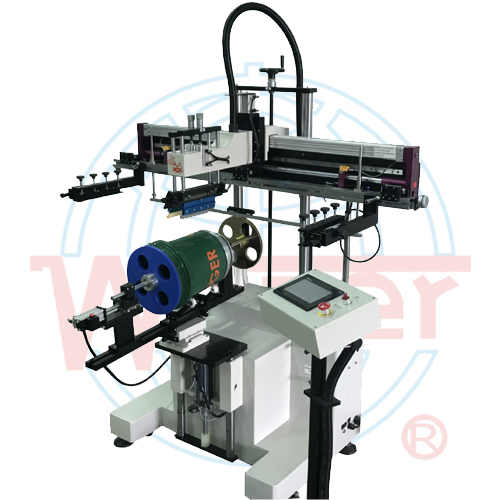 The transmission system of the machine utilizes a direct imported Japan make linear bearing guide for extremely stable printing. Clamp cylinder 32*80(mm), easy manual feeding & unloading. Motor type auto registration is designed for easy multi-color printing.